Valentine's Day is in one week and if you don't have reservations, you'd better act fast. (WXYZ) — Valentine's Day is in one week and if you don't have reservations, but you plan to go to dinner with your significant other, you'd better act fast. The are thousands of restaurants to choose from, so how do you find just the right one? Well, here are seven in our Thursday's Top 7. Iridescence comes in at #7. In addition to the great food, Iridescence is also known for its panoramic view of the Detroit skyline. Cafe Cortina in Farmington Hills lands in sixth. The food is rustic Italian and the setting is inspired by the Italian countryside. Detroit's Giovanni's come in fifth. A mother - son team leads Giovanni's as they cook up classic Italian cuisine. There are also modern inspired dishes too! Savor seafood? Try Joe Muer. Their newest location is in Bloomfield Hills. 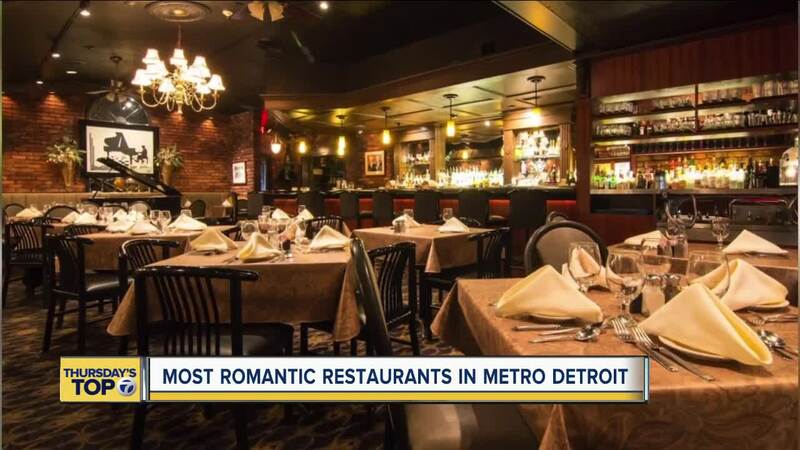 But both Detroit and Bloomfield Hills spots score high on the romance meter. The Whitney comes in at number 3! Here, you can dine in all the romance and charm of this 19th century mansion. Be sure to check out Detroit's hip Ghost Bar for drinks before your Valentine's Day meal! Andiamo Detroit Riverfront lands in second with its fine dining along the Detroit river. The pasta is from scratch and the beef is aged in-house. The kitchen expects to serve up to seven hundred guests on Valentine's Day. And don't be surprised if someone pops the question, according to Andiamo's Mike Nowinski. "We always get people engaged here all the time and Valentine's Day is a huge day for that." The top spot in our online viewer polls goes to Mr. Paul's Chop House in Roseville. Steak and seafood are their claims to fame. Mr. Paul's has live music Tuesday through Saturday evenings, so count on music to set the mood this Valentine's Day. Some restaurants do offer special menus for Valentine's Day. For instance, Iridescence offers a four course prix frixe menu for $85 per person. Many other restaurants do, too. Check out their websites to get a sneak peek of their Valentine's Day offerings.